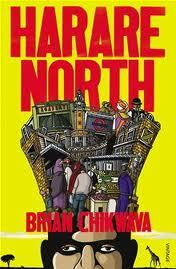 Harare North is a novel about illegal migrant life in London. Our unnamed narrator isn't your typical hero - he is a young, ex-militia who had to flee Zimbabwe to escape his old life. Although he claims political asylum from Mugabe's regime, he is actually a supporter of Mugabe, and he plans to use his time in London to make around US$5000, return to Zimbabwe and buy his way out of the trouble he is in. Once in London (Harare North), things aren't as easy as he hoped. He is constantly searching for 'graft' to raise money, ends up living with his childhood friend Shingi in a squat in Brixton with other immigrants, is constantly struggling to find food, is introduced to some interesting people (like Tsitisi who rents her baby to women who want to get council houses and Aleck who claims to be a Croydon shop assistant), and does some not-so-nice things all so he can make his US$5000. I found Harare North simultaneously sad and hilarious. The narrators situation is far from pretty but he always found humour in everything and found ways to go kak kak kak. The first thing that struck me when reading the novel was the language. It is mainly in pidgin (broken) English but it felt like Nigerian pidgin (I don't know if they speak pidgin the same way in Zimbabwe). As I read I also noted hints of Jamaican patois and cockney. I actually loved the fact that the book was written that way. I also loved Brian Chikwava's description of Britain's cold weather and particularly Brixton (Cold Harbour Lane, the market) - it felt like I was in Brixton. Harare North is a not-so-pretty book about the psychological pressures of an illegal immigrants life that I would recommend. Please don't be put off by the use of pidgin English (you get used to it after a while) and I think it's one of the many things that make this book. Thank you Brian Chikwava, for giving me yet another reason why I love literature from Zimbabwe :), but there's still one thing I am unsure of - and that is the narrators relationship with his friend, Shingi.